Tissue paper lanterns can add color and soft, glowing light to a room in need of decoration or an outdoor patio that needs sprucing up. They work as a permanent accessory in any room or a temporary decoration at a party. 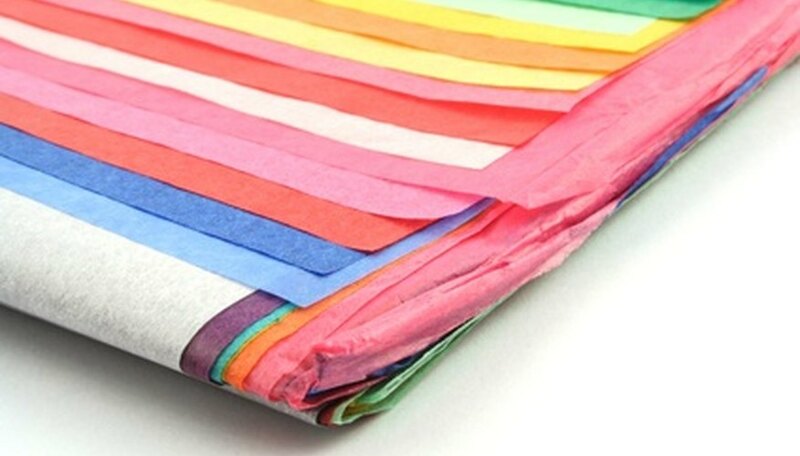 Create square tissue paper lanterns which take up little space and fit into a box or on a shelf for quick storage. Lay a Popsicle stick and draw a straight line vertically on each end of the stick where it starts to curve. Place the stick on a cutting mat and use a utility knife to cut off the ends along the line you drew. Place and hold a metal ruler along the line to guide the utility knife and protect your hands from cuts. Smooth the ends of the stick with sandpaper and repeat the process until you have 25 Popsicle sticks total with straight edges. Arrange two Popsicle sticks running parallel and balanced on the thin side, not the large flat side. Have a friend hold these two in place while you set up two more Popsicle sticks, which should connect the two parallel sticks on both ends to create a square. Move the sticks so the two sticks forming the left and right side of the square are on the outside and the two sticks forming the top and bottom of the square are scooted in so you can glue the edges to the outer sticks. Glue the sticks in place with a hot glue gun and allow the square to dry. Make four other squares in the same fashion. On the last square, create a base square by gluing four to five Popsicle sticks across the square to provide a base for resting a small light on when the lantern is finished. Lay out the five total squares in a row on the larger flat side of the Popsicle sticks. Leave an inch between each square and place the base square at the bottom. Apply white glue along the flat part of the Popsicle sticks currently on top. Lay a large piece of colored tissue paper over the five squares and smooth it out over the glue. Allow the glue to dry completely. Apply glue to the Popsicle sticks on either side of the squares and smooth the tissue paper down over the sides to cover the square frame. Allow time to dry. Lift the lantern and turn it over. Apply glue to the back side and smooth the tissue paper over the back. Trim away excess tissue paper. Apply glue to the top of the lantern and smooth the tissue paper over the top of the Popsicle sticks to hide the frame. Trim away excess and tuck the edges of the tissue paper down into the lantern. Apply glue to the bottom of the base square and fold tissue paper over it. Smooth it down and trim away any excess paper. Glue the tissue paper either across the entire base or only across the outside Popsicle sticks, leaving the rest uncovered. This allows more light to emit from the bottom of the lantern. Place a small light, such as a battery-operated tea light, into the base of the lantern. Glue it to one of the Popsicle sticks stretching across the base or leave it unattached so you can remove it if necessary. Infused Goods suggests the tea lights as a safe way to make your lantern glow.